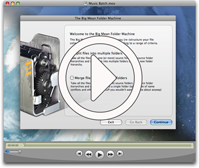 The Big Mean Folder Machine allows you to specify custom date and time formats for splitting your files into separate folders. This mechanism works by using a "pattern" supplied by you, which contains "placeholders" that will be replaced with the actual date and time values of each file. You can use plain text in the pattern to add particular characters in between the different date components, e.g. "<hour0>h <minute0>s"